Natural attractions of this object is not known as Mount Bromo in East Java. However, the privilege is very unique and very different from other tourist attractions. Away from the noise, the atmosphere is natural, beautiful and not one building standing on this island as a place of lodging or restaurant. 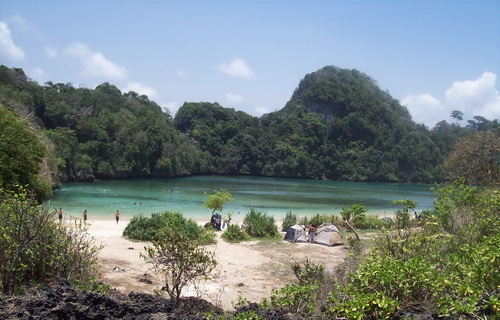 Sempu Island is a small island on the southern island of Java. The island is located in Malang, East Java. Currently Sempu nature reserves are areas protected by the government. The island has more than 80 species of protected birds and other animals such as wild boar, deer, langur java and see if luck, the traces of the leopard. Besides swimming, visitors can relax from the beach volleyball. For lovers of the natural atmosphere of the original and far from the city noise, Sempu Island is a great destination to visit the place. The uniqueness of this island is to travel at low tide, when we can cross to Sempu island from Java Island. Visitors tend to depart and return from the Island Sempu in the morning and afternoon, because crossing the island can only be done at this time. In this island there is a lake called Segara Anakan. Where water is discharged into the lake of water waves on the reef. Most of the water flowing into the Segara Anakan by a stone with a hole in the middle. If visitors want to spend the night on the island, could stay at the inn-inn owned by communities along the coast road to Sendangbiru. Or it could also open up a tent on the island Sempu. However, visitors should ask for permission first at the guard post at Sendangbiru, located directly opposite the island of Sempu. This is done for the sake of preserving the habitat and the surrounding attractions of this Nature Reserve.